When a corporate group changes its structure in a corporate reconstruction and transfers property between group companies, it may be considered a dutiable transaction and liable for transfer duty. For example, if a parent company transfers a business it owns and its assets to a subsidiary company, this would be liable for transfer duty. A corporate group seeking an exemption from the duty otherwise payable on a dutiable transaction or a relevant acquisition must apply in writing to the Commissioner of State Revenue. For the following corporate reconstruction transactions, you will need to complete the forms listed. a certified copy of the foreign company share register (if applicable), certificate of incorporation or company constitution. Alternatively, for a proposed transaction (where a ruling from the Commissioner is required), you can lodge your application to cr@treasury.qld.gov.au. notify you of our decision in writing. part or all the consideration for the transaction is provided or received by a person other than a group company. There are exceptions to this requirement, which are set out under section 412(4) of the Duties Act. Contact us on 1300 300 734 or email cr@treasury.qld.gov.au if you need more information. Company A is the parent company (as per section 401 of the Duties Act 2001) of Company B because Company A directly owns 90% of Company B’s shares and has voting control. Company B is the parent company of Company C because Company B directly owns 90% of Company C’s shares and has voting control. Company A is not the parent company of Company C because Company A does not directly own 90% of its shares. 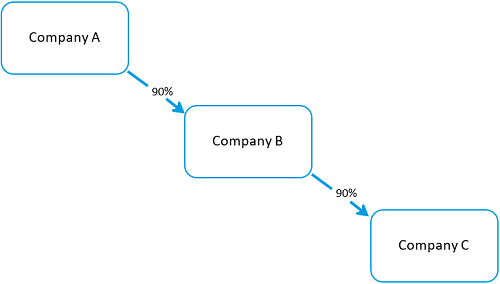 Company B is the subsidiary (section 402 of the Duties Act) of Company A because Company A directly owns Company B’s shares. Company C is the subsidiary of Company B and, because Company B is the subsidiary of Company A, Company C is also a subsidiary of Company A. Companies A, B and C are considered group companies and together form a corporate group (section 400 of the Duties Act). Read Part 1, Chapter 10 of the Duties Act to learn more about exemptions for corporate reconstruction.